When stepping in a strange country for your settlement due to your job or your other plan, you must be rather anxious about local people and their habits and customs. Then gradually you have to adapt yourself with a new environment. The shortest path to do it is to find a good local house in lieu of staying in hotels yourself and your family/ relatives. In Hanoi, there is variety of properties to rent in Hanoi that are in a nice style with fully or partially furnished. Thus, it is not a difficult duty to find out a good houses for rent in Tay Ho that fits your needs. In this article we will introduce to you everything you need to know about Tay Ho district (from history, place to eat, play or even where to shop? Where should you stay) before you come to stay here. Located on the north side of Central Hanoi, Tay Ho is an urban district of which the name means West Lake – a very famous lake in Hanoi that is located within the district. The district was officially recognized to be a district in 1995. It is regarded as a center of entertainment, tourism, and natural conservation of Hanoi and includes such wards as Nhat Tan, Phu Thuong, Quang An, Thuy Khue, Tu Lien, Xuan La and Yen Phu. 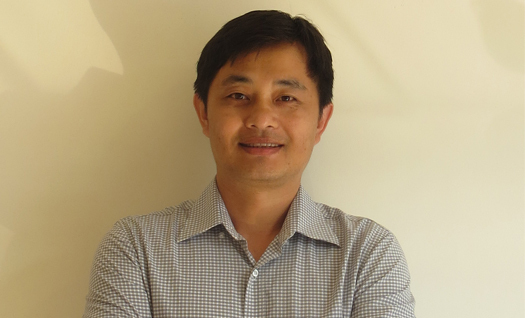 Being adjacent to Long Bien district to the east, North Tu Liem district to the west, Ba dinh district to the south, and Dong Anh district to the north, Tay Ho is a high-end residential area with a large population of expatriates due to its close proximity to central Hanoi and scenery of the West Lake. Herein there are many streets named after renowned Vietnamese poets, artists and music composers such as Nguyen Dinh Thi, Xuan Dieu, Dang Thai Mai etc. Where to stay or living in Tay Ho district? Due to the fact that it has a large population of expatriates and vast area, it is quite easy to find a villas for rent in Hanoi. There are a list of available villas and houses for rent in Tay Ho with private swimming pool, large garden, lake view and modern amenities. Villas for rent in Tay Ho area generally have from 4 to six bedrooms with garden, car access, good size swimming pool, spacious living room and fully equipped kitchen and large bedrooms. Almost villas for rent in Tay Ho in particular and villa for rent in Hanoi in general has from 300 - 1000m2 land area and living space. Hanoi capital is a high dense city so it is not very easy to find a villa having a larger than 1000 m2 land area; just some villas includes a large garden. Almost Villas for rent in Tay Ho are part full furnishing or non furnishing with such basic furniture as kitchen, full air conditioners, washing and dryer machine. West Lake area in Tay Ho district is always the best place selected by almost expats moving to Hanoi for their stay. Tay Ho is a district that boasts some of the most interesting attractions around town including Phu Tay Ho, West Lake and Truc Back Lake. Being good for restaurants, business, sightseeing, West Lake area in Tay Ho district is a great place for home and the perfect spot to explore amazing attractions so almost people moving to Hanoi love to stay and almost expats moving to Hanoi love to find a villa for rent in Tay Ho district – West Lake area to live. The properties in West Lake area - Tay Ho district nowadays are much more modern and efficient than few years ago; there are more new serviced apartments such as Fraser Suites, Elegant Suites Westlake, Sommerset Westlake and houses or villas for rent in Tay Ho district coming up. 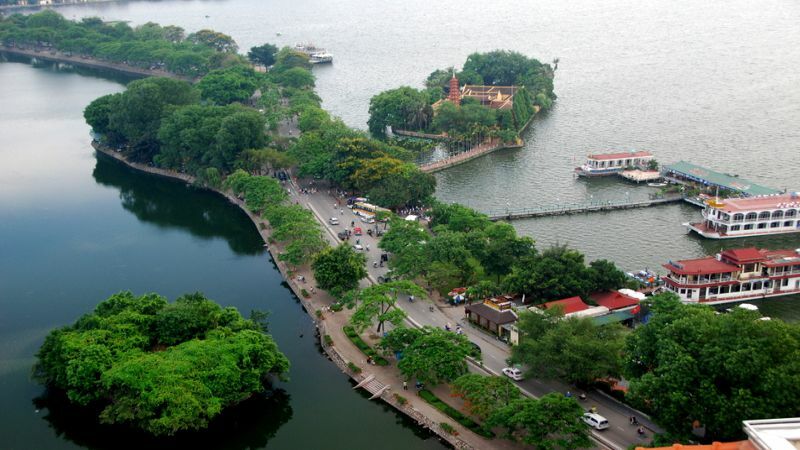 West Lake (in Vietnamese we call Ho Tay) is a freshwater lake located in the center of Hanoi. This is the largest lake in Hanoi with a shore length of 17km and a popular place for recreation with many surrounding gardens, hotels and villas. Thanh Nien road divides a small part of West Lake to form Truc Bach Lake. 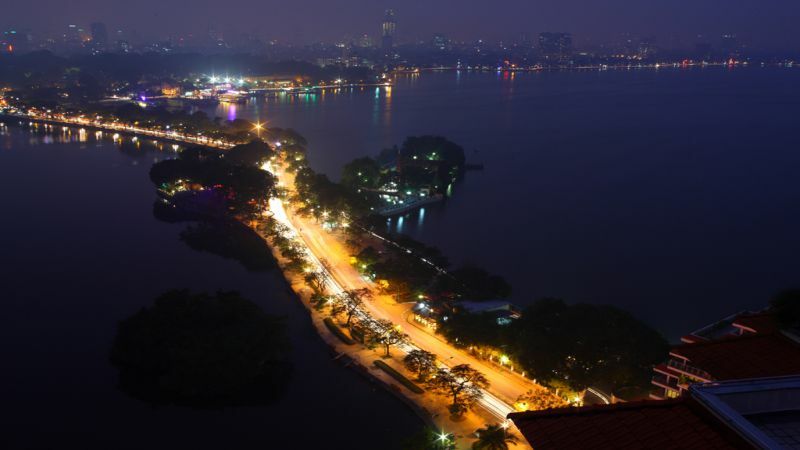 Being the largest lake of Hanoi and located right in the center of Hanoi, West Lake area has many gardens, hotels, restaurants and other entertainment centers. For this reason, the price of houses, apartments and villas for rent in Tay Ho – West Lake area is staggering and the surrounding quarters are often full with imposingly large edifices of rich Vietnamese people and expats. It is easier to find a villa and a house for rent in Tay Ho – West Lake area than other areas in Hanoi. Where to shop? Where to visit? And where to eat and drink in Tay Ho district? Tay Ho District is one of the most visited destinations in Hanoi. There are a lots of attractions, including Phu Tay Ho, Ho Tay Water Park and West Lake, being must-sees while visiting the neighborhood. Tay Ho District is good for sightseeing, restaurants, business and the district also has a lot to offer travelers and residents. Many local and international restaurants, cafe’s, shops located on Xuan Dieu and To Ngoc Van street for your relax. That’s reason why expats always prefer to find houses or apartments for rent in Tay Ho district to stay during their time in Hanoi. Visitors will be fascinated by Sheraton Hanoi Hotel – a luxurious hotel which features picturesque views of the West Lake. Guests are also provided with convenience of transportation as it is a 10-minute drive to downtown Hanoi and the Hoan Kiem Lake. Facilities at the hotel include outdoor pool, fitness center, and car park. Guests have plenty to do during their stay with a 24-hour fitness center and a relaxation center including sauna rooms and massage services. Or a fitness center – Elite at 51 Xuan Dieu street is one more option. For dining, the restaurant of the hotel serves an international buffet and seafood specialties. It just takes about 10-minutes to walk from Sheraton hotel to Ho Chi Minh Mausoleum and One Pillar Pagoda; and 10 minutes to drive to reach the famous Water Puppet Theater, Dong Xuan Market, and the Temple of Literature. It takes about 40 minutes to drive to Noi Bai International Airport. Horizon International Bilingual School: 98 To Ngoc Van street, Tay Ho, Hanoi. Sakura Kindergarten: 275 Âu Cơ street, Tay Ho, Hanoi. As mentioned above, Thanh Nien road divides a small part of West Lake to form Truc Bach Lake. Hanoi has many streets named after celebrities, many streets with names relating to its residents’ traditional occupation, but only one street with the name of the young generation – that is Thanh Nien Street (in English it is called The Youth Street). Thanh Nien street has the original name of Co Ngu Street. In 1960, young people from schools, universities, offices and firms were mobilized to improve and widen the street. For this reason, the street was named Thanh Nien street by Uncle Ho. At one end of the street, Uncle Ho grew a banyan tree beside Ly Tu Trong statue. It can be said that Thanh Nien street is one of the most beautiful streets of Hanoi, attracting many local people and expats coming up here for walking along the lake side and enjoying very beautiful lake side views of West Lake and Truc Bach Lake. Thanh Nien Street has length of about 1km from Quan Thanh Street to Yen Phu descent, separating West Lake and Truc Bach Lake (West Lake and Truc Bach Lake are always well-known as two very famous and beautiful lakes of Hanoi). On the street, there are two very well-known historic places of Hanoi naming Quan Thanh Temple and Tran Quoc Pagoda. Every morning and every night, many local people and expatriates come to this street to walk under the shade of trees and to enjoy a colorful picture of flowers in the green background of leaves, feeling fresh natural wind from the two lakes. Thanh Nien street is known as a famous love space for young couples to meet, confide and dating. At the No. 28 of Thanh Nien Street is the best place of Lake View where you can enjoy beautiful gentle waves of West Lake. Not very far from this address is West lake shrimp cake restaurant where serving shrimp cake – a very famous specialty of Hanoi. 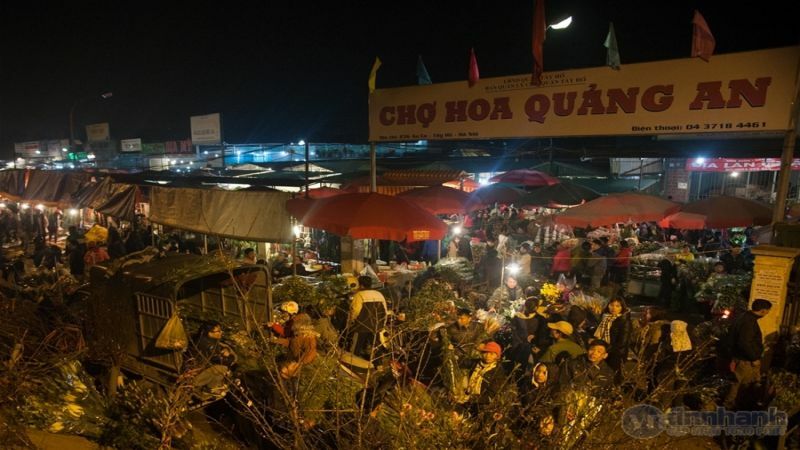 The Quang Ba Night Flower Market in Tay Ho district offers a variety of fresh flowers from all flower villages across Vietnam such as Dong Anh, Soc Son, Me Linh, Dalat, and Nhat Tan. The night market is open as early as 02:00, and this is a place where you can find rows of colourful daisies, cherry blossoms, roses, orchids and sunflowers. You can purchase your favorite flowers here separately or arranged in bouquets. The market is especially busy during the Vietnamese traditional annual Tet Festival. If you’re a flower enthusiast and an extremely early morning riser, this night flower market is surely an interesting place for your visit. Travelling by bus has become more and more popular in Hanoi generally and in Tay Ho district particularly due to the low cost and its convenience. The bus stops are located along the streets, with the signal of blue boards detailing the bus routes. At the major bus stops, there are also the city map and all the other routes for your reference and information. Buses are available every 5-15 minute, operating continuously from 5.00 a.m. until 9.00 p.m. The ticket price is the same to everyone, both locals and foreigners. Bus is the only public transportation in Hanoi so it reaches almost every main street in the city. Many bus stops are for famous and attractive tourism destinations such as Hoan Kiem Lake, Ho Chi Minh Mausoleum, The Old Quarter, Hanoi Train Station (Ga Hanoi), Literature Temple and museums. Please keep in mind that in Tay Ho district, the bus number 14 will take you to the West Lake with famous tourism destinations such as Tran Quoc Pagoda and Quan Thanh Pagoda. With such convenient transportation, you should not worry about your travelling when you live in a house/ an apartment or a villa for rent in Tay Ho district. In conclusion, Tay Ho is a great and popular district for expatriates to find villas/ apartments and houses for rent because of its vast land area and more peaceful and fresh than almost other areas in Hanoi. 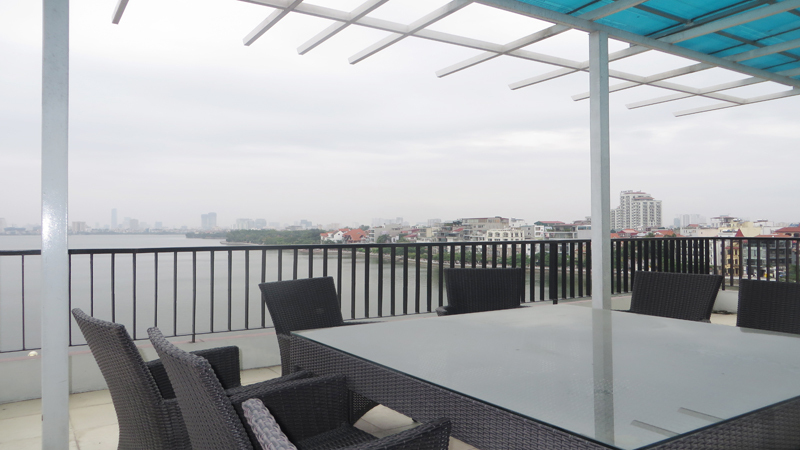 Tay Ho is regarded as a great place for living in Hanoi, so finding a villa/ an apartment or a house for rent in Tay Ho district is your good choice.